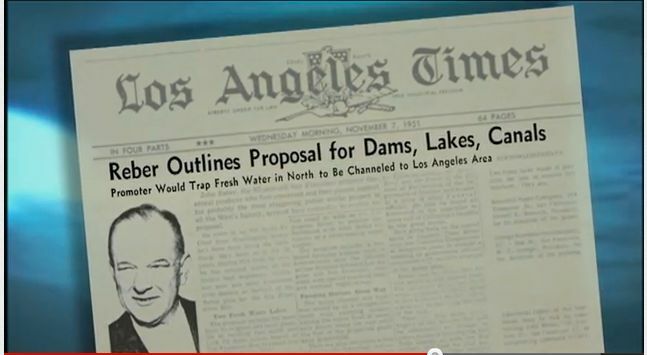 If these 1950s ideas for solving California’s water problems don’t frighten you, we don’t know what will. Happy Halloween! Sidney Cornell, a Los Angeles construction engineer, circulated an idea for transporting Northern California water to the parched southern end of the state without all the trouble and costs of lengthy canals, pipelines and pumps. He proposed building giant cannons to shoot water into the air for capture miles away, as depicted in a 1951 Mechanix Illustrated. Perhaps the time for Cornell’s idea has come. Why spend billions of dollars to tunnel southbound water under the Delta when we can simply shoot our way out the problem? Just plant one of those gargantuan Cornell Cannons at the intakes from the South Delta to the Sacramento River near Hood, which could use the tourist attraction. Point the gun toward Clifton Court Forebay and fire away! Call it the Super-Peripheral Air Cannon, or Super-PAC. Imagine a column of water arced high over the Valley and falling at say 9,000 cubic feet per second. Pretty scary, especially if the big gun is a tad off target and hoses Tracy. Unlike Cornell’s pipe-less dream, John Reber’s plan for quenching LA’s thirst actually took flight – for a spell. Reber, a theatrical producer who fancied himself an engineer, called for damming San Francisco Bay to capture and store the freshwater inflows for export to Southern California by canal, not cannon. One dam would be between Marin County and Richmond and another would bridge San Francisco and Oakland, creating two giant freshwater lakes. The dams would be causeways that could carry as many as 32 lanes of traffic, plus railroad tracks. Reber also sought to shrink the bay with 20,000 acres of fill for development, including more military bases. Reber’s idea created a media buzz and enthusiasm from some members of Congress. The Senate Public Works Committee held hearings in San Francisco and then recommended that the Army Corps of Engineers build a model of the bay to test “the Reber plan.” The 1.5-acre model, which reproduces tidal action, currents and the mixing of fresh and salt water, showed that the Bay-Delta estuary would be destroyed. The freshwater dams would create only giant evaporation ponds. You can watch the simulation at the Army Corps’ Bay Model Visitors Center in Sausalito. Watch for the ghost of John Reber at low tide. 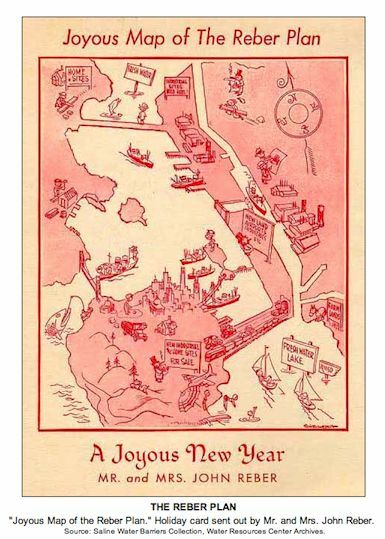 Those aren’t bloodstains you’re seeing in this 1957 vision of California’s water future. The red blobs though should send chills down your spine. They signify prospective reservoirs. 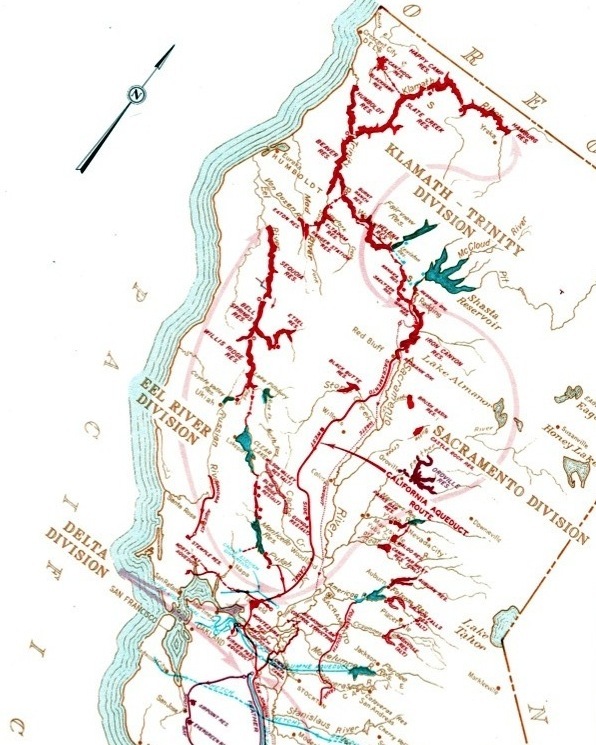 That’s right, virtually all of the Klamath River and most of the Trinity and Eel river systems would become chains of lakes. Never mind the salmon. A series of pumping stations would reverse flows south for channeling down the Sacramento Valley, and on through giant Delta pumps for export to farms and cities south. The proposed California Aqueduct System would be the great equalizer of water resources, redistributing Northern California’s “surplus” water to less endowed central and Southern California. But the plans for turning North Coast rivers into reservoirs remained just that – plans, which today are best kept in the closet, like skeletons. John Metcalfe. Oct. 3, 2012. 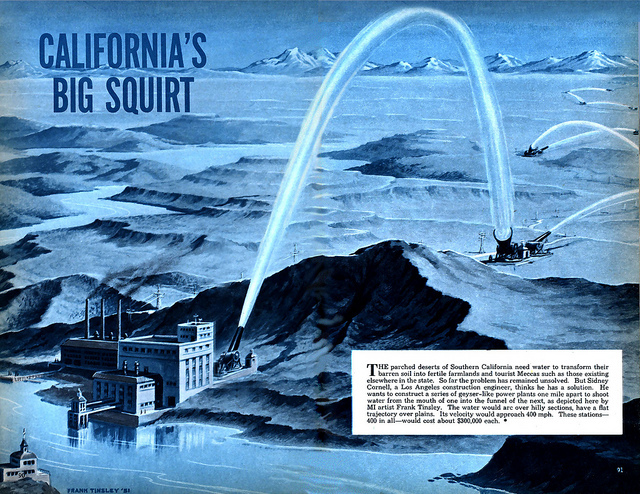 A Look Back at 1951’s ‘Big Squirt,’ California’s Improbable Drought Remedy Concept. The Atlantic Cities. Ron Blatman, KQED/KTEH Public Television. The Reber Plan: A Big Idea for San Francisco Bay. UC Berkeley Library. Bridging the Bay: Bridging the Campus, Unbuilt Projects. June Morrall. Nov. 1, 2007. Bay to Lake: A Failed 1940s Plan Would Have Turned San Francisco Bay Into Two Lakes. Halfmoon Bay Memories. The California Water Plan, Bulletin No. 3. Sacramento, California. California Department of Water Resources, 1957. This entry was posted in Uncategorized and tagged Halloween, John Reber, The 1957 California Water Plan, The Cornell Plan, The Reber Plan. Bookmark the permalink.